It’s been just over a year since I reviewed some open source writing apps, so I thought it would be a good time to check back in and see what, if anything, has changed in the interim. It also gives me an excuse to take a break from my own work, and from America’s ongoing national crises. Last time, I stressed the importance of open source code (and the Linux OS) in terms of autonomy, freedom from commercial exploitation, and privacy. I continue to believe in these criteria. Eric S. Raymond famously wrote about the importance of openness in The Cathedral and the Bazaar, and there’s no doubt that open source software has become enormously influential since then—the Internet runs on it. Yet many people, writers included, remain only vaguely aware of the distinction between open source and commercial software. What’s more, to the extent that they are aware, many people believe commercial software to be superior. 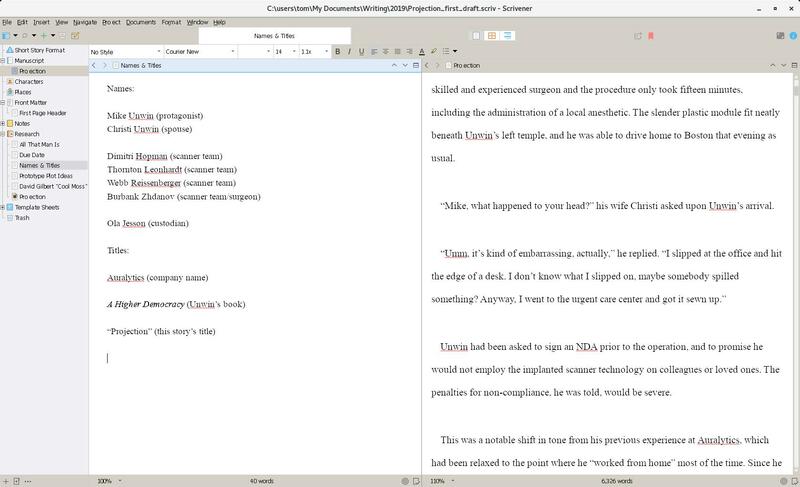 Still the best: Scrivener 3 Windows beta running on Linux via Wine. There’s little doubt that a dedicated commercial team, properly motivated, can accomplish wonders. In this field (writing software), Scrivener is the outstanding example. But as I argued a year ago, I think Scrivener is the exception. Its developers seem to be at least as motivated by the desire to serve writers well as they are by the urge to make money. Quality is the preeminent focus, and it shows. iA Writer is another proprietary program that fits this model; unfortunately, they do not plan to release a Linux version, and the newish Windows version will not run under Wine. However, commercial imperatives drive some decent software right off the rails. I’m still incensed by the decision Ulysses made to employ a subscription model—there is no justification for it, apart from a naked desire to maximize profits. And I note that sometime over the past year, the mystery-shrouded Write! application has made the same greedy decision. The latter case is especially telling in terms of the vulnerabilities you may encounter with commercial software. Write! has always been coy about who the developers are and where they are located (they are located in Kiev, the Ukraine), and the program requires you to log in in order to use it. You can save your work to their servers, which are also vaguely described. Write! is a potential privacy nightmare, and their decision to start charging a monthly fee after purchase only adds insult to injury. OK, then. Rant over. Let’s take a look at what’s new with open source writing tools. First off, there’s a new writing application to report, or rather the revival of a previously languishing application. 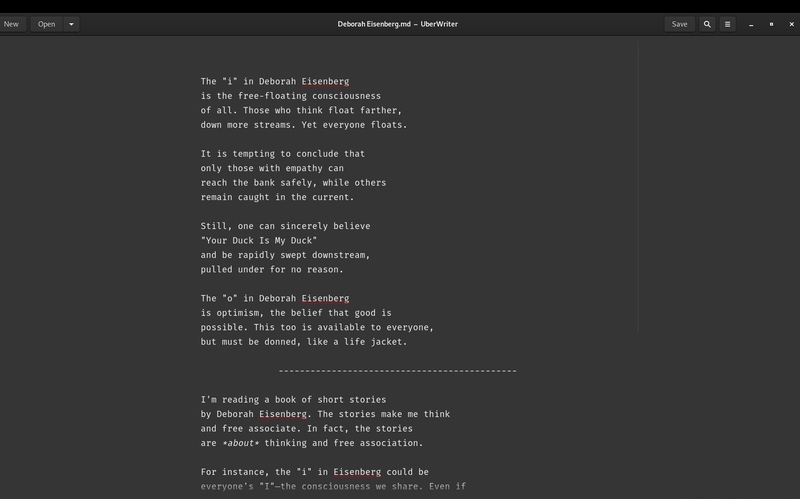 It’s called UberWriter and it was directly inspired by iA Writer. Its young creator, Wolf Vollprecht, wrote the app for an Ubuntu App Showdown and it was named one of the Top 10 Ubuntu Apps of 2012. Vollprecht charged $5 for it at the time, but then the program was idled for several years (this happens in open source development, especially with young programmers). Now the software is being actively worked on again, with the addition of a second developer, Manuel Genovés, and it’s licensed under the GNU GPL v3. 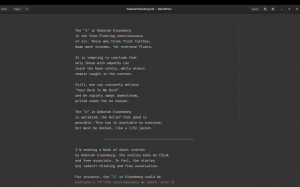 UberWriter was inspired by iA Writer and has a similar look and feel. UberWriter is written in Python and it’s quite nice—you can definitely see the iA Writer inspiration in its look and feel. Like iA Writer, it has an optional “focus” mode which greys out all but the sentence you’re actively working on. (I hope the developers will also try to implement something like iA Writer’s Syntax Control, where adjectives, nouns, adverbs, verbs, prepositions and/or conjunctions can be highlighted; this is extremely helpful for brief, concentrated writing like poetry.) 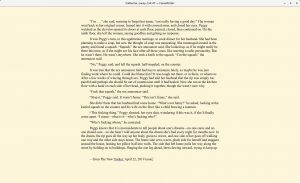 UberWriter uses Markdown and it can export to .odt and .rtf, along with .pdf and .epub, among other formats. I’m glad the app is back. It seems very promising, and it’s already quite useful for shorter work. The chief downside: it’s only available for Linux. Here’s what’s up with the other open source writing software reviewed last year. LibreOffice Writer remains a superb (and I believe superior) alternative to Microsoft Word. I’ve noticed that more literary publications are open to accepting .odt files these days, but even for those that continue to insist on .docx or .doc format, Writer’s compatibility with Word is such that this is a non-issue. Writer is very actively developed (as is the entire LibreOffice suite). 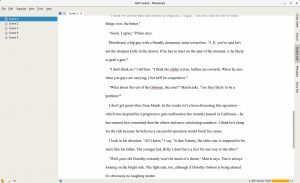 The Organon plugin for novelists that I mentioned last year has seen no development since then, but it still works fine with the current version of Writer. Writer is cross-platform (Linux, Mac, Windows), as are all the programs that follow below. I think it’s essential for any writer. FocusWriter: an exemplary open source program. Graeme Gott’s outstanding FocusWriter is also actively developed, and I still intend to provide a full review of this wonderful application at some point. 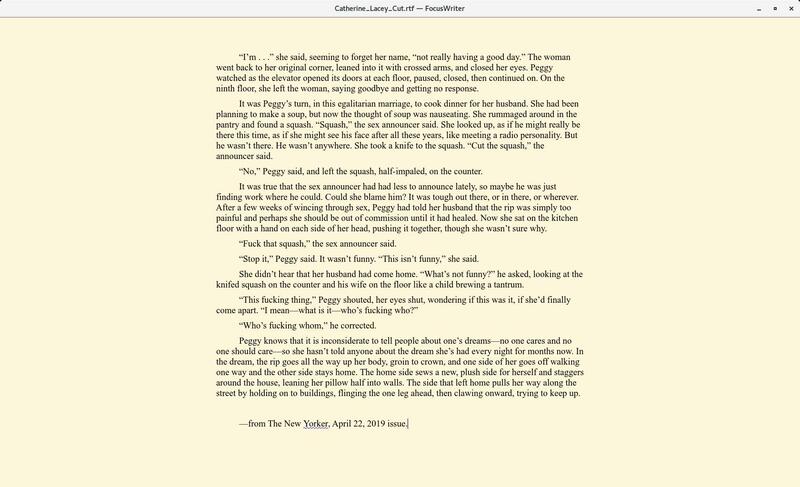 FocusWriter has multi-document support when you need it, though it’s not really intended for lengthy projects like novels (that’s what the next three programs do). It can be customized to look exactly as you want, and it really shines for short-form work of all types. 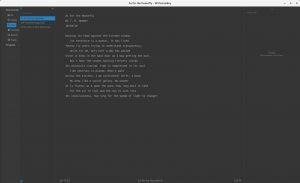 I think FocusWriter is an exemplary open source program, and it’s well worth adding a tip for the developer when you download it. This “tip jar” approach is far more appropriate for open source projects that offering a handicapped free version and a full paid version, as some apps do. Bibisco is one of those apps, and I tend to rule it out for its payment model alone. It hasn’t changed much over the past year—there is still no distraction-free mode, for example. And I actually find the program to be quite homely. In addition, I think its character-driven approach is overly rigid. Plume Creator is still under development, but slowly. Its creator, Cyril Jacquet, states that an entirely new version is underway. The current version (0.67) is available to download from SourceForge for Linux, Mac and Windows. Since the interface hasn’t changed, I’ll refer you to last year’s review for an overview. Plume Creator is helpful and usable now and I look forward to an eventual new release. 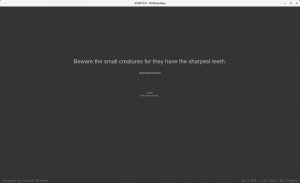 Manuskript is probably the best Scrivener-inspired open source program. 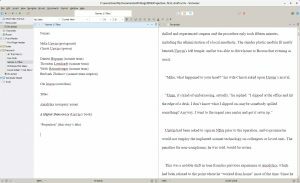 Manuskript, my favorite Scrivener-inspired program from last year, has been updated: it’s now at version 0.90 (ever closer to that key 1.0 release). The look and feel of the program are much the same (again, see last year’s review for a more complete description) but the application’s exporting capability has been noticeably improved. It’s now possible to export directly to .docx with fairly decent results. You can also, as before, export to plain text, then use a program like LibreOffice Writer to export to the format of your choice. Like Plume Creator, Manuskript is very usable now and it’s growing more so. 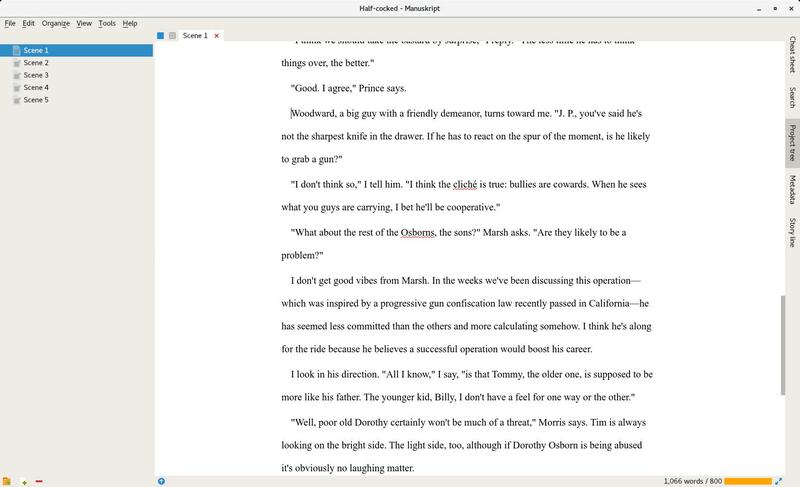 Scrivener remains the preeminent tool for long-form writing, but it’s good to see these open source programs striving to provide some of the same functionality. 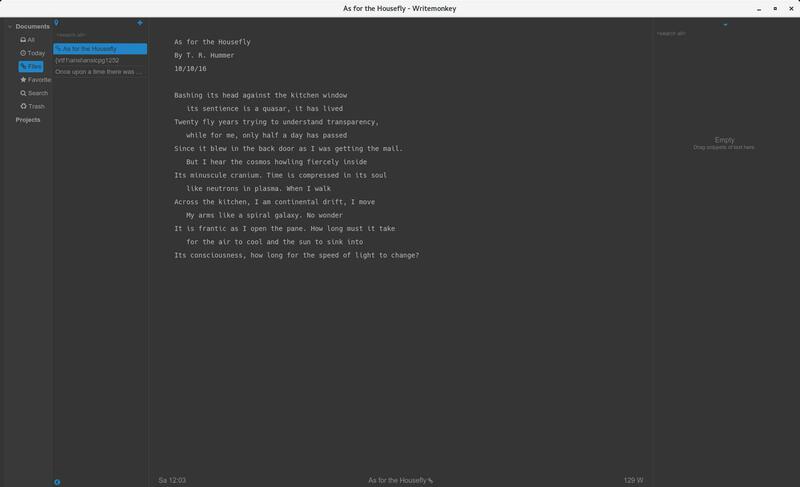 WriteMonkey—not open source, but recommended nonetheless. I would add “enormous flexibility” to that description. 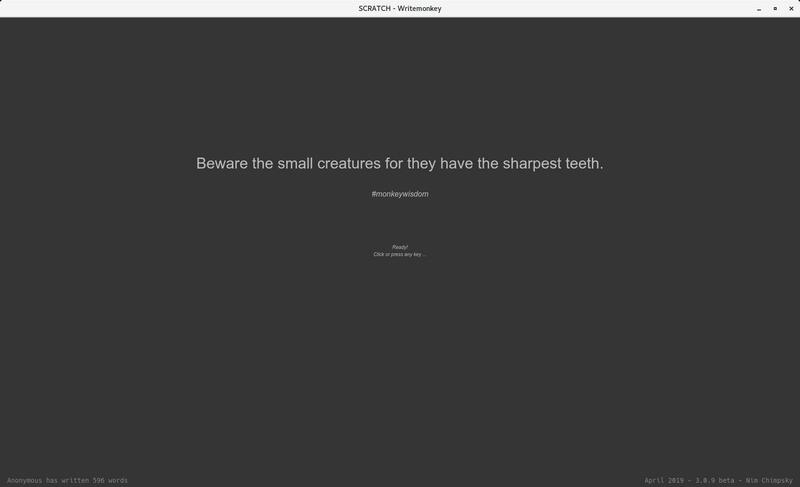 “Monkey wisdom” on the splash screen. There are more than a thousand such quotes. Although WriteMonkey is not open source software, it is free. It follows a donation model, much like FocusWriter—the free version is in no way stripped down, as it is with Bibisco. And if you decide to donate you can unlock bonus functionality with various WriteMonkey plugins. This is a fair arrangement, in my estimation, particularly when you consider what the basic program can do. Unlike the questionable Write! application, WriteMonkey doesn’t hide its source or location: it’s developed by Studio Pomarancha in Ljubljana, Slovenia. If you’re put off by the Balkans origin, you shouldn’t be—WriteMonkey has been around for well over a decade and I’m not aware of any sort of security or privacy issues that have arisen with it. It’s a very capable and polished free program that deserves to be used alongside the open source apps recommended above. Sometimes, particularly when it comes to American politics and society, I wonder what the point of these monthly musings of mine actually is. Well, that’s not strictly true—I do know what the point is, and that is to explore and express my own feelings about what’s happening in this country. Is this any more productive than going to a demonstration, volunteering for a candidate or posting to like-minded friends on Facebook? Perhaps, but only in this regard—writing for this blog forces me to confront my beliefs honestly and express them to the best of my ability in a more considered way than other options permit. Otherwise, no. The blog probably has less practical impact than making a donation would have. I don’t expect to change many minds or have any effect at all on our current dire circumstances. Still, I feel that “getting it out” rather than suppressing what I feel about the current state of the country is an essentially healthy thing to do. One of the positive things I continue to admire about the United States is the freedom of expression it still largely permits. We haven’t yet reached the point where individuals, or media at large, are censored. One can see that possibility on the horizon, though. The Mueller Report—an Unfortunate Copout? Photo: Politico. Which brings us to the dispiriting Mueller Report. Why spend 22 months on a 300-plus-page report only to stop at a wishy-washy conclusion? Particularly when Trump, the person at the heart of the report, has said and done enough in public view to suggest obstruction charges would be valid? 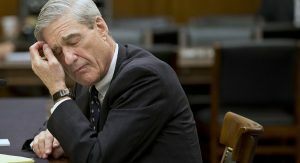 Everything considered, Mueller’s long-awaited report (and its subsequent brisk downplaying by a biased Attorney General) is another indication of the failure of American governance. Yet life goes on. Other investigations are underway, by entities perhaps less inclined to bow to the current federal power structure. Many, many American citizens (a majority, I believe) are appalled at our situation and want to do something about it. The Democratic Party race for 2020 is on, albeit with far too many candidates announcing far too early. Trump is a freak of nature and circumstance; he can’t be self-sustaining. The real threat should be viewed as the right-wing Republican Party at large, which is insidiously increasing its hold on power by the day. The focus must be on stopping and reversing this, by targeting voter suppression, gerrymandering and the anti-democratic influence of the Electoral College. And of course, we must also aim to prevent foreign power interference next time around. And now for something completely different: the Outline trilogy (or the Faye trilogy, if you prefer) by Rachel Cusk. Cusk’s novelistic trilogy concluded last year with Kudos and has received tremendous praise on both sides of the Atlantic. It’s generally acknowledged that Cusk has created something genuinely new with these books. 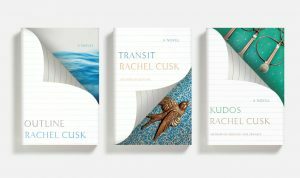 Rachel Cusk’s Outline Trilogy: something genuinely new. Photo: lithub.com. Many reviewers have described the trilogy novels as belonging to the “autofiction” category popularized by Norway’s Karl Ove Knausgaard. I think that’s wrong—to me, the books come closer to what one might term “negative literature,” in that they strip away many of the traditional lineaments of the novel, such as plot and dialogue. Yet describing her books as negative literature doesn’t capture Cusk’s achievement, either. It’s not what Cusk leaves out that’s important, but rather the seemingly random conversations and observations she puts in. I think Cusk has created a new kind of stream-of-consciousness for the age of Trump and Brexit (the latter of which Kudos observes in passing). It’s no one person’s interior thoughts portrayed here, jumbled together throughout the day, but rather an observer’s—Faye’s—registering of others’ diverse thoughts and observations, alongside and largely in place of her own. The effect is remarkably lifelike, far more so than Knausgaard’s autofiction. (I had some minor difficulty making it through the first book in his series, but found each of Cusk’s books to be brisk, engaging reads.) Outline, Transit and Kudos have collectively been termed cool and cruel books. They are definitely cool; there is a built-in distance in these recorded observations. I’m not sure the books should be termed cruel, though. What they are is relentlessly honest. If they are cruel, then they are reflecting life itself. The state of the union is extremely precarious. Regardless of anything our fraudulent president might have to say when the delayed (through his own arrogance and stupidity) State of the Union address eventually takes place, it is beyond dispute that the United States is more polarized today than at any time since the Civil War. 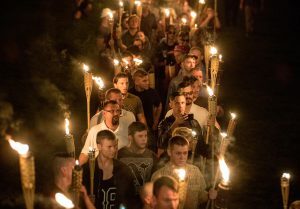 Chanting “White lives matter!” “You will not replace us!” and “Jews will not replace us!” several hundred white nationalists and white supremacists marched in Charlottesville, VA in August 2017. Photo: Washington Post. To say we are “polarized,” though, is an incomplete explanation. Further, it implies a rough equivalency between the two estranged sides. There is no equivalency. On one side there is liberal democracy. On the other, a crude, atavistic nationalism that is being used by the extremely wealthy to further their own interests. 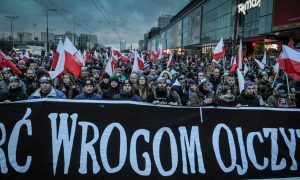 Polish nationalists march in November 2017. Photograph: Jaap Arriens/NurPhoto via Getty Images. There is, though, one important distinction which may yet be America’s salvation. Europe is a collection of nation-states attempting to act within a common framework (the EU). We are a collection of states attempting to act within a national framework. The importance of our national framework was clearly evident during Trump’s recent, longest-ever government shutdown, when planes couldn’t land at LaGuardia and millions couldn’t get paid or live their normal lives. Every American citizen depends upon the U.S. government, whether they acknowledge it or not. It is these ligaments, these much-maligned civil servants, that currently hold us together. Trump and the Republicans would retain only enough government power to maintain their place at the top. We must fight, as Europe must, to keep liberal democracy in place. Without it, we will have no union. 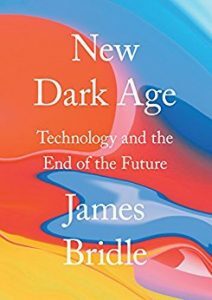 This post is intended as a brief personal supplement to all of the 2018 “best books” compilations out there—you won’t find many surprises, as the four books below will likely appear on most of those lists. I’ve restricted myself to fiction because it’s my primary interest, and also because I believe it does a better job of capturing the essence of things than non-fiction can. None of these four titles directly tackles the strange and dangerous time we’re in. But all of them, The Witch Elm possibly excepted, reflect some aspect of our topsy-turvy present. Actually, The Witch Elm does as well, thanks to the hallucinatory aspects of key parts of its story. Tana French’s latest mystery rises to the level of “literary fiction” (as does most of her previous work) and appears on the New York Times 100 Notable Books list. Here, then, are four very different books from 2018 that will provide you with enjoyable reading and resonate after you’ve finished them. 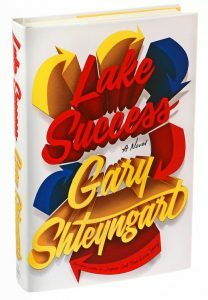 Gary Shteyngart’s Lake Success. Photo: Sonny Figueroa/The New York Times. Gary Shteyngart’s Lake Success provides the most direct take on present-day America. The novel, Shteyngart’s fourth, sends his protagonist, Barry Cohen, a rogue hedge-fund manager, on a bus tour of our discombobulated country. There is plenty of sharp social satire, as we’ve come to expect from this writer, particularly aimed at the moneyed class but sparing no one. Barry is a protagonist in the picaresque American road-trip literary tradition but he is also an oblivious, self-centered bungler acting out a privileged midlife crisis. He carries six very expensive wristwatches (Cohen, like his author, is a watch nerd) and a rock of crack cocaine (obtained after chatting with a Baltimore drug dealer) on his journey. I recommend Lake Success for its sharp observations of wide-ranging American inequalities and absurdities. 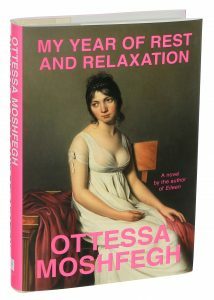 My Year of Rest and Relaxation, by Ottessa Moshfegh. Photo: Alessandra Montalto/The New York Times. 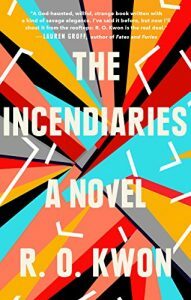 If alienation is your thing, Ottessa Moshfegh is your writer. And who isn’t alienated these days? Like Lake Success, My Year of Rest and Relaxation is darkly comic. But it is less satiric and more absurdist, and also quite a bit darker. The unnamed narrator, an unhappy woman in her mid-20s who lives on the Upper East Side, resolves to sleep for a year. She is able to do this because both her parents have died, and the cash from her inheritance enables her to buy her apartment and remain free from work worries, at least for a while. (She has a job in an art gallery but loses it for sleeping in a storage closet during lunchtime.) She is also aided and abetted by a loony therapist (“Dr. Tuttle”) who prescribes staggering quantities of sleep-inducing drugs. The year is 2000, and our narrator believes that “…when I’d slept enough, I’d be O.K. I’d be renewed, reborn. I would be a whole new person, every one of my cells regenerated enough times that the old cells were just distant, foggy memories.” She proceeds to embark on her year-long sleep, waking each day for 2- or 3-hour periods to eat and/or watch TV before diving back under the covers. She is periodically visited by her quasi-friend Riva, a former roommate from college. Riva is big on self-help books and frequently dispenses advice which the narrator ignores. Underneath her escape into sleep, the narrator is interested in art (“I wanted to be an artist but I had no talent,” she says). At the end of her long sleep, she finds herself at the Met in September 2001, mesmerized by a painting which she reaches out and touches. 9/11 is just around the corner. I recommend My Year of Rest and Relaxation for its unique (if disturbing) voice and its strong, solipsistic focus amid the chaotic daily world. 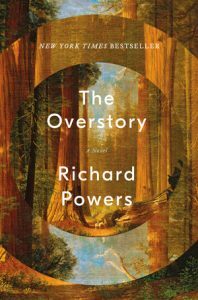 The Overstory, by Richard Powers. Photo: W. W. Norton & Company. Richard Powers’s The Overstory presents another unique perspective, this one somewhat more hopeful. Rather than retreating inward, Powers reaches outward to encompass an entire, hiding-in-plain-sight civilization that parallels our own: trees. People want to read about people, of course, and Powers accommodates with a wide cast of characters, all of whom have lives that intersect with trees in some way. This sounds formulaic; it’s really not. Nor is it anthropomorphic, as Kingsolver is, deliberately, in the paragraph above—Powers gives trees their due as amazing but horribly abused creatures, but he does so in the service of a compelling human story. In the process, he reveals how closely bound the fates of trees and humans actually are. Given today’s existential threats (climate change, nuclear winter), this could be viewed as an expansion of pessimism—two species in peril rather than one. But I find the implicit threat is offset by the incredible richness, in every sense, that trees convey. I recommend The Overstory as a mind-expanding way to see the wider world anew. The Witch Elm, by Tana French. Photo: Sonny Figueroa/The New York Times. 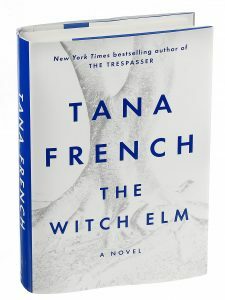 Tana French’s The Witch Elm is nominally a mystery, the first stand-alone novel outside her popular Dublin Murder Squad series. As a mystery, it’s first-rate—some of the story’s surprises will take your breath away. But this book has more than murder on its mind. The Witch Elm is actually a meditation on randomness and personal fate, and I recommend it both as a gripping read and a reminder to feel grateful for each day disaster doesn’t strike. If you’re the sort of person who believes in moral truths such as murder should be punished, disadvantaged people should be offered a hand and lies should be unmasked (and a majority of Americans still hold these beliefs), then you’ve been having a hard time with the news lately. The ongoing dismantling of American values is a hard thing to witness every day. It’s no wonder that people sometimes turn away, seeking whatever relief they can find elsewhere. Hobbies are one way to take some time out. In my case, quite literally—I’ve developed a new appreciation of the nuances of horology. Some time back, I was superficially into watches, primarily as a status thing I must admit. Rolex, Omega and Tag Heuer seemed like essential business accessories. Now, I have a renewed appreciation for the art of watchmaking itself and status is no longer a consideration per se. I’m glad to have outgrown my former shallowness. The Seiko SARB035—incredible value for money. Photo: Pinterest.com. The person most responsible for my renewed and deepened interest in fine watches is the novelist Gary Shteyngart. His most recent book, Lake Success, features a protagonist (hedge fund manager Barry Cohen) who is a WIS (Watch Idiot Savant). The novel is quite good in its own right, by the way; it’s made the annual New York Times 100 Notable Books list. Rolex is the only high-end watch most people know. They think it is either the ne plus ultra (not true) or gaudy, overpriced crap (also not true). Since the quartz crisis of the eighties and early nineties, the Swiss watch industry has largely recovered. Most WIS people prefer mechanical movements on aesthetic grounds, though they remain less accurate than quartz. One company—Seiko—makes very high quality watches at every price point, from $100 or so to $50,000-plus (via the Grand Seiko line). If you’d like to explore for yourself, check out Hodinkee, Worn and Wound and A Blog to Watch (Shteyngart occasionally writes for Hodinkee). You’ll rapidly pick up nuances along with fundamentals: the very wide range of brands, including some small Kickstarter-launched companies; the technical aspects of fine watchmaking; the rich history behind the storied names. There are many, many video reviews out there (check The Urban Gentry channel on YouTube), along with various helpful forums (try Watchuseek). I wound up (pun intended) refurbishing a couple of vintage Tag Heuers and buying a range of Seikos at various price points. 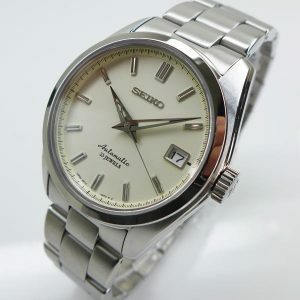 My favorite watch so far is the Seiko SARB035, the cream-dial beauty in the photo above. It, along with its black-dial sibling the SARB033, have recently been discontinued, so their prices have edged past $500 and are still rising. But they could cost two or three times that amount and still represent tremendous value—see the numerous reviews (for example, here and here) comparing them to Rolex or Grand Seiko models to see what I mean. My SARB035 was purchased to mark a milestone. I’ve owned a Rolex Explorer II in the past, and it is not unreasonable to compare the Seiko to the Rolex, despite the wide divergence in their price points. As for future milestones, I’d like to mark them with a Nomos, probably a Rolex again, and (ultimately) a Grand Seiko model. But that’s off in the future. For now, my little foray into horology has enabled me to temporarily escape the horrors of the news cycle. But only temporarily. Whatever outside interest you can find to distract yourself, go for it—everyone needs a break now and then. But be sure to come back. You’re going to be needed. As the midterms approach, some people are expressing hope that things can begin to change. If only the Democrats can take the House, at least there will be some check on Republican power, they say. I believe this is short-sighted, wishful thinking. The Democrats could take all of Congress, and take back the presidency in 2020, and there would still be some 40% of Americans festering in ignorance and hatred. Despite its name, this country has been only sporadically united, and then only under severe external threat (financial ruin, world war). We have always been divided. I believe it’s time to acknowledge this fundamental truth once and for all. 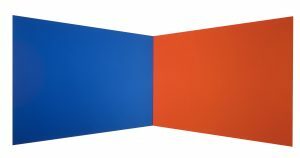 Blue Red by Ellsworth Kelly, thebroad.org. Creating separate blue and red Americas is fraught with danger, of course. Yet the alternative—trying to remain together—is at least as perilous. Hatred and violence are growing by the day, and the current nation’s gun “policies” are insane. Rather than the constant, growing battle for social and cultural supremacy, why not let each side go its own way? Why not appoint ambassadors from each side to negotiate a separation agreement? Well, one reason is that the more perceptive residents of Red America would quickly recognize they were getting the short end of the stick. The international power and clout of America reside largely in the blue states, as does America’s intellectual and cultural capital. The ordinary red(neck) citizenry might say “good riddance,” but the smarter denizens of Texas and Missouri would soon realize they’d be at a considerable disadvantage as a stand-alone country. Does the above paragraph reflect my anger and contempt for Trump-supporting America? You’re goddamned right it does—political animus is by no means restricted to the backward-looking heartland. What, then, is the answer? Should Blue America simply secede? Much as I’d love to live in that new country, the answer is, probably not—secession would almost certainly lead to some sort of new, 21st century civil war, or at the very least to an escalation of the already intolerable level of everyday violence. We’re at an impasse, folks. What to do with that problematic 40%? The Democratic Party doesn’t seem capable of taking and holding power in this country. And holding power would be necessary, if for no other reason than to reestablish a strong public education system to stamp out the appalling ignorance that underlies our present situation. With all its inherent difficulties, then, some sort of formal separation seems to be our best bet going forward. But it won’t be easy. Simple, straightforward, but of course still unfulfilled. Yet the promise is there, clearly evident in the words “any person.” Unfortunately, as the Times notes, the promise is receding even further as the Supreme Court continues to tilt right. 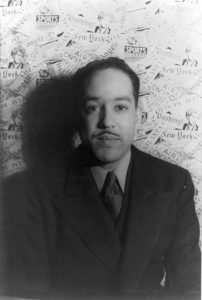 Langston Hughes, photographed by Carl Van Vechten. Source: Wikipedia. The second piece, published by columnist Roger Cohen today, is headed “America Never Was, Yet Will Be.” The line is from the Langston Hughes poem “Let America Be America Again,” and it too deals with a promise that remains unfulfilled. A deep, magnificent promise that was once resonantly symbolized by our Statue of Liberty. A promise still alive for many around the world, even in our current dark times, even if it can never be realized under Trump’s appalling administration. In his poem, Hughes addresses America’s downtrodden, still plentiful today. Such people are the spiritual ancestors (I am the poor white, fooled and pushed apart) of many of Trump’s current supporters, and those supporters remain fooled, too distracted by “fake news” to see the truth and act accordingly. From The Collected Poems of Langston Hughes, published by Alfred A. Knopf, Inc. Copyright © 1994 the Estate of Langston Hughes. The poem’s full text was taken from Poets.org.